Nicole, wouldn’t it be cheaper if I just hired a virtual assistant myself? It’s a question I’ve heard a time or two. Or twenty. And it’s a question I honestly understand. I currently own this small business whose site you are on (thank you!). And for years, as an admin myself, I was involved with or witnessing daily the decisions owners and executives are faced with as they seek to make the best use of both their company’s hard-earned money and their own all-too-scarce time. You want to save money. And yes, you could hire someone yourself. And maybe it would work out great. Because all too often, there are glitches when you’re trying to do something that you’re not really trained to do. There’s a reason why there are HR specialists, and why hiring managers go through hours and hours of training in order to make the best matches for each job. Those glitches cost money. Even an $8/hour employee can end up costing a company around $3,500 in turnover costs, both direct and indirect. The reason you’re hiring an assistant is because you want to make money, not spend it. The reason you’re hiring an assistant is because you want to have more time to do what you love, not less.. Hiring someone to match you with a great virtual assistant isn’t a waste of money. It’s an investment that gives you back the time and energy you’re already stretched for. Here’s an example of all the things you *don’t* have to do to save a few bucks, when using a service. You don’t have to prescreen. A great virtual assistant a VA who knows your industry, the software you’re using, the protocols for your field, and everything in between. You don’t have to weed out the ones who are stretching on their abilities or who want to learn your business. It’s done for you, and you can get the right person in place, quickly. You don’t have to find the quality candidates. This is just a hunch, but we’d bet you don’t have a database of multiple CPA’s, admins, social media experts, bookkeepers, or paralegals gathering dust somewhere. Of course you don’t! You’re too busy out there doing what you love. But we know some of the best admins out there, we know their availability, and we can hook you up with them. You don’t have to do the additional training. There is someone out there who is exactly who you need, and who’s looking to work for someone just like you. You don’t have to go out and find someone who *almost* fits, but who you will need training to get them up to speed. A VA service shortens the time you spend hunting for an assistant, interviewing them, negotiating with them, hiring them, and training them. You don’t have to re-do the process if things fall apart. 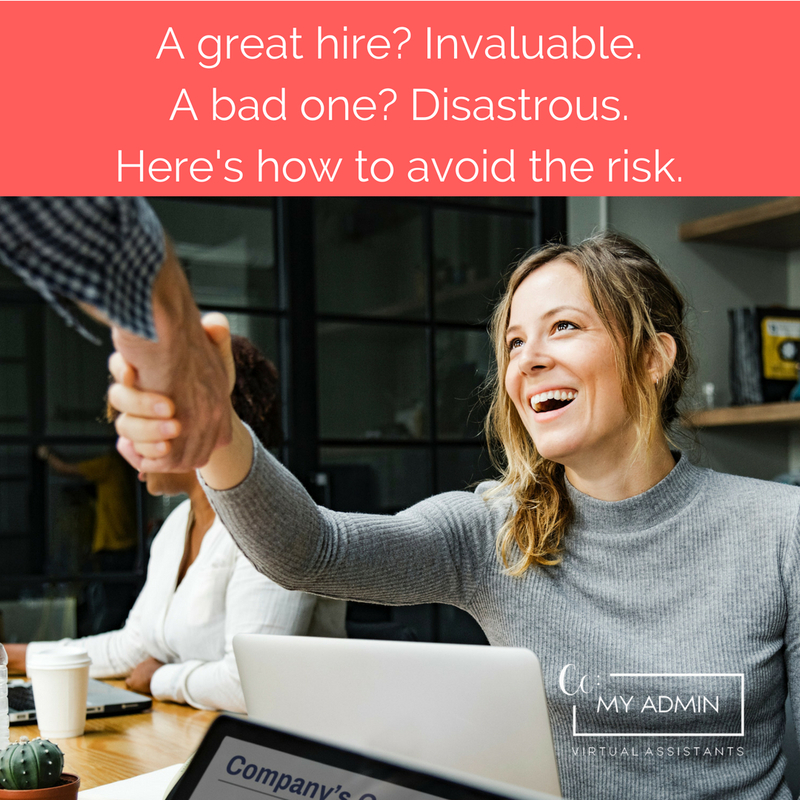 There are too many horror stories out there of business owners investing a good chunk of time into the process of hiring and training someone, only to figure out the assistant isn’t a good fit and having to start the Whole. Thing. Over. With a VA service, your chances of starting with the right person are high, but even if the match fizzles, the service is there to set you up with someone else who better suits your needs. It’s a service that can not only save you a tremendous amount of time and money but also make sure you’re not emotionally frazzled from having to deal with that stress over and over again. You don’t have to start over again when it’s time to add another role. After you’ve embraced the virtual culture, you may soon find yourself wanting to outsource a different role. If it’s one your current assistant is not suited for, a VA service you’re already involved with can easily work with you to add new staff without having to start from scratch. Have an admin but need social media? Done. Have a paralegal but want to add bookkeeping? That’s an easy add. Make a call, add the role, get matched with VA #2, and you’ve gotten even more off your plate. Hey, in the Pinterest age, we all have ambitions of being a great DIY-er, the idea that maybe we could get the same results as a professional. But we all have probably sold off a bunch of unused fitness equipment because the only time we got results were with a trainer at the gym. Or had to go to a salon to get our hair re-done after we botched the home cut or dye job. Or… well, you get the picture. Some services are just worth paying for, and if this one gets you back out there drumming up business and bringing in money, do you really want to risk doing it yourself?